What about just making the Noble family members start neutral. That was the initial intention, but we ended up making the nobles starting positions as well because of the chance (though remote) of a player being eliminated in the first round. Anyway we might have some good suggestions now. -The map be played mainly on the Court rather than on the ground. -The Lord Chamberlain being a too strong position for 1v1 games were the first player could easily grab it while transferring one of his Castles’ stacks there, making an easy 4 army bonus (4 nobles) + 1 auto-deploy that the second player could never disrupt on its turn. -The fact that most of the bonus is in auto-deploy mode will greatly work against any kind of pilling up and will encourage empire building. I like your possible solutions besides the first one. I don't like the idea of the castles starting neutral. It's not a very appealing map to me if I only start on the nobles. I think the issue may be solved with a combination of these. My only other solution would be to nurf the Chamberlain's bonus. For example instead of +1 for every family member held, it could be +1 for holding, +1 auto-deploy, and +1 with King. That way players will go for other Council members since they all will be more equal, while having their own distinct advantages. Well, it would almost be the same. It would only be a matter of 1 or 2 rounds till every player has its respective Castle... and we wouldn’t have to bother about those initial stacks from Castles. OK, I think a couple things in the rules need some clarification... the big thing is whether or not archers and other bombarding territories can also attack outside of their hex. The other thing is minor, but with the Duke or Bishop you mean hold two knights/villages for +2, a player must also hold the bishop of Duke, correct? It seems clear enough but its worded strangely as to imply that without the council member it still might be possible. I can't say whether or not it should be changed, as it might just be me. The killer neutrals on the Trebuchets seem rather high considering they don't do much more than a catapult. I'd recommend neutral 2 or 3. There appears to be an unfair advantage a player might have... it seems half the castles have two villages adjacent while others only have one adjacent to the castle. I'm thinking it should be all one way or the other. Unless you've balanced this already somehow and i"m not seeing it. There's a few quirks in the map that I'm on the fence with how to deal with them. For example, castle F is at some sort of advantage in that no impassable archer is nearby, while the other castles have to deal with this. Is it an undue advantage? I dunno, because should you really have to be able to take out a player's base through the same methods 8 times? Probably not, there could be a different best solution to each castle, but the question is: is there a fair enough solution to assaulting castle f? Like i said, I'm on the fence with it. Thoughts? Like the above example, Castle H is pretty well surrounded by neutrals whereas the other castles usually have a path of 1s leading right to them. Which leads to perhaps an unanswerable question... how will these games play out? If its anything like the other conquer maps, players are going to sit on their castles and wait. But I think there is enough incentive to not do this, given the surrounding bonuses. How do you anticipate the games will play out? Thank you helix for your input!!! Industrial Helix wrote: OK, I think a couple things in the rules need some clarification... the big thing is whether or not archers and other bombarding territories can also attack outside of their hex. They will start with 3 neutral troops on them. They are the only region that can be assaulted by catapults ( and where you can use those 2 auto-deploy troops that catapults produce). Trebuchets can be quite useful to bombard Castles and near by productions. That was intentional, to compensate the possible advantages of Castles on corners. I still don't (really) know if having those 'reachable' archers will work as an advantage or a disadvantage.... on one hand they are easy to reach from Castle F, on the other this castle will be more exposed to archers than the other Castles.... It's just that I personally don't like symmetries for this kind of situations. Chip and I, we've been talking about the 1's, not only there but across the entire map. We strongly believe that much of those 1's will not necessarily be used. What I'm trying to say concerning Castle H situation (this could be applied to the other castles as well), is that people will reach it by Trebuchets and Archers than by just travelling trough the 1's. That's the million dollar question here. We (Chip and I) definitely don't want a 'pill up your stack and kill your opponent in 3 rounds' kind of map. The bonus structure (as addressed in the previous posts) will surely prevent that. The large amount of these bonus are autodeployable but generous, so standing still while getting fat will turn to be very unprofitable. ..is there someone out there...? I've been keeping up with this map. I never got the second part of my last question answered and it seems like you and chipv have taken over the discussion on what should be done. I'm not complaining but it may leave others like myself feel their feedback is not noted. That is my impression. To be honest, I'm pretty content with the way you've answered my questions. The big question, which can't be revealed now, is how this map is going to play out. Will players stack or will they attack? I'm sorry if a CA analysis is taking a while. This is a fairly complicated map of the sort that takes a decent chunk of time to analyze; once one of us finds the time we'll give a nice, thorough review. Hopefully that won't be too long. mattattam wrote: I like your possible solutions besides the first one. I don't like the idea of the castles starting neutral. It's not a very appealing map to me if I only start on the nobles. I think the issue may be solved with a combination of these. Castles are starting positions. Only the unassigned castles would be neutral otherwise you would get an uneven drop of castles. The nobles being starting positions was a first attempt to prevent an outside shot of killing on the first turn. player has taken a turn which is not going to please anybody. Your second comment I can certainly get behind as the Chamberlain is going to be more attractive than the other counsellors, I agree. and offer some other attraction like perhaps +2 with any counsellor, ideas welcome. Your comments are not being ignored, I have been horrendously busy, sorry about that,please keep your posts coming! chipv wrote: What I want to prevent is securing a counsellor that has an autodeploy and simply forting from the Castle. 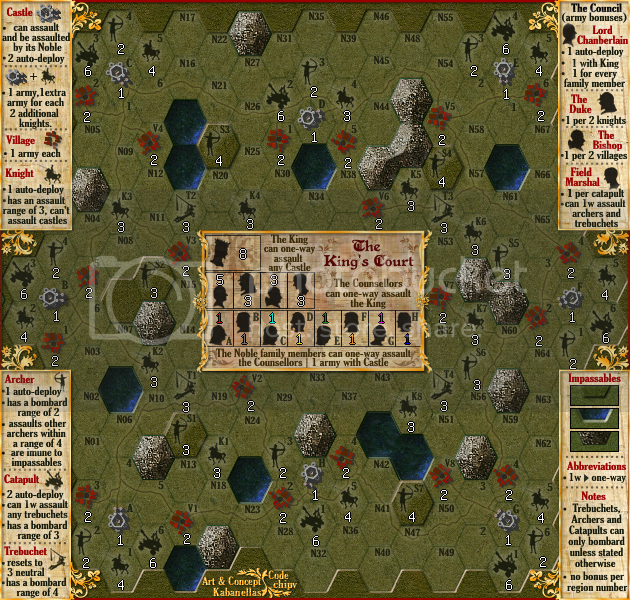 The best way to solve that problem would be to make the Nobles the ONLY starting positions (to avoid initial stacks from castles), removing the auto-deploy from the nobles, while adding a castle+noble bonus and raising the Lord Chamberlain starting neutrals to 5. This would make the assault on castles mandatory and favour the expansion on ground. mattattam wrote: My only other solution would be to nurf the Chamberlain's bonus. For example instead of +1 for every family member held, it could be +1 for holding, +1 auto-deploy, and +1 with King. That way players will go for other Council members since they all will be more equal, while having their own distinct advantages. Matta, I did consider it, the way you said. And I'm not putting it aside though, it's just that I would like to make it exponential like the other counsellors. Hellooo, everyone. Love the map! I PMed the mapmakers to get my bearings, and based upon Kab's reply I think I have an idea of the underlying concept for the gameplay on this map. I heartily support all other regions being at 1 neutral. With the starting positions, however, I think more than 1 troop is needed. Consider that a 4 vs. 1 attack has only an 80% chance of success on the first try- that means a 1 in 5 chance of failure. So, consider an 8-player game: there's a very good chance that at least one player will fail to take their castle... not a very fun start. I'm also a little hesitant about using the nobles to attack the castle. Yes, it fixes the problem of 1st-turn kills (14% was a problem) but it also feels like a clunky fix. If I were a player in such a game, and there was only 1 logical place to attack on my first turn, I'd be asking myself, "Why didn't I just start there instead?" The first round becomes effectively a 'dead round' where everyone just takes (or tries to) their castle on their first turn. If it needs to be, it needs to be, but I'm keen to look for other solutions, as it will definitely add some frustration and detract from an otherwise fun map. When I first read this map, I was a bit overwhelmed. The text itself is fairly clear, as is the map... there are just too many mechanics in play. Most of what I'm talking about here is the multiple instructions for each icon, when only one or two of those mechanics seem to have a unique, thematic purpose. Now, I must say that this map does a very good job establishing thematic gameplay purpose and giving uniqueness to that gameplay But sometimes, it proceeds to add on more stuff that may be overloading the map and adding little. The Duke encourages players to gather Knights; the Bishop prompts them to collect villages. So far so good. I very much like (3), it seems to be in thematic step with the other Councilors. Plus, it encourages players to pursue a group of icons- Family Members- who otherwise give no bonus. This adds depth to the gameplay, and yet by using the same formula as the other Councillors, does not add complexity because the mechanic is essentially the same (if that makes sense). What does (1) accomplish, however? It only encourages a player to hold onto the Chamberlain for its own sake- no connection with the other Councillors. A similar question is posed for (2). Why does a player need encouragement to pursue the King? He's powerful enough in his own right. You've already had to increase the Chamberlain neutral to 5 because he's more powerful than the other Councillors- perhaps, you could bring him back in line with the others, and at the same time get rid of needless complexity on the map. I like (1), for the same reasons as I liked (3) for the Chamberlain- it fits with the thematic mechanic for the Councillors. But (2), however handy, has all sorts of unwanted side effects. First, it largely eliminates any need for a player to need access to the King; with the Field Marshal, a player can attack any neighboring Archer (or Trebuchet) and bombard a Castle. True, a player can't take the Castle for himself, but it nevertheless acts as the kind of 'quick strike' attack that the King also offers. Second, it involves two different families of icons- catapults/trebuchets and archers- which adds complexity to no apparent purpose. I mentioned this in the PM I sent out, but I'll summarize what I said here. I don't like the Catapult-Trebuchet mechanic as it stands. In light of the fact that the purpose of the map is to encourage empire-building and pursuing multiple strategies, I think the "Stack, Stack... Strike!" strategy runs against the spirit of this map. And yet the Catapult-Trebuchet mechanic encourages exactly that type of behavior. There already is a good, late-game "Quick Strike" mechanic available- the King. I don't think another is needed (another reason, btw, to modify the Field Marshal too). OK, that's all I've got for now. I do have some suggestions for improving the clarity of the icons and legend, but that's minor really and can wait until the larger gameplay issues have been settled. Keep up the fantastic work, and thanks for all the hours of enjoyment I've had on your maps, Kabanellas- I look forward to this one! Thanks a lot Marshal for such a detailed analysis. MarshalNey wrote: With the starting positions, however, I think more than 1 troop is needed. I just though of making them lower so when you start with 2 nobles you don't get a chance of trying a lucky shot and grab 2 castles - if nobles started with 2 that would likely happen. But again, I can change it. we could start with 2 in the castles - on which will add 3 + the 2 bonus auto-deploy, equalling 7. Seems a pretty reasonable number. The Nobles should start with neutral 1 and yield a 1 auto-deploy bonus. I'd honestly prefer to make the Castles the starting points if you guys see no problem with these numbers. in the Lord Chamberlain case, I felt the need to add the extra layer bonus, to make them compatible with the other in terms of gains. In 5,6,7,8 players games adding family members will be quite difficult, while the Duke and the Bishop have a better capability of enlarging their owner bonus. So the other 2 layers appear naturally - for conceptual reasons the Chamberlain + the King makes perfect sense to me, while the + 1 auto-deploy could fit in the logic of him being the most influential member of the court. again, the same reasons apply here. Catapults are few and hard to get. So giving him a more operational feature could apart from compensating the less-bonus characteristic, be inside the logic of what a Field Marshal should be. I could, of course, lower his power by giving him access to only 'S' Archers, for instances. I'm good with changing these mechanics, and so is chip. Well, the 91.6% is only if a player is willing to attack down to their very last troop- something I am sometimes reluctant to do, as each attack is of course independent in terms of odds... in other words, once I know that my best chance (a 4 vs. 1 = 80%) has definitely failed, then the odds of success are reset to a lower level. There's no "I'm due for a break" aspect in actual practice, truly random, independent events invite streaks. So I think it's fairer to use 80%, given that more level-headed players might naturally want to stop after a failed 4 vs. 1 or possibly even a 3 vs. 1 (since the odds are still "favorable" with 3 vs. 1). Even if we assume that all players are willing to be gutsy and attack down to their last troop, however, that still leaves an 8.4% chance per 8-player game that someone won't take their castle. That's 1 in 12, so on average every other 8-player game this will happen to someone. I think it's a big enough deal to avoid, because it will highlight the more frustrating aspects of the Risk mechanic for every 12th player on this map. Kabanellas wrote: I just though of making them lower so when you start with 2 nobles you don't get a chance of trying a lucky shot and grab 2 castles - if nobles started with 2 that would likely happen. But again, I can change it. This is a good reason, but I think the one above is better. Your numbers sound good- starting at 2, yielding 7 on the first turn to work with. With a 1-value neutral adjacent, everyone should be able to take a card in Spoils games as well... or if they don't, it's their own fault or crazy bad luck. I especially think that this will work if the quick-strike aspect of the catapults is removed(see below), since that problem seems to have been the main reason that the castles became neutral in the first place. Well... I've been thinking about it a bit. The biggest improvement I think might be to just get rid of the trebuchets entirely. It's one less icon, which makes the map more accessible to players. This is nothing glamorous, but how about making more catapult icons, say spaced 3 apart, which would work much like the Archers in terms of 'development'? Each catapult can assault other nearby catapults, gradually progressing within range of the castle itself. There seem to be places where you could put catapults on existing impassibles (if they were changed from mountains or lakes, that is), but this idea might mean shuffling some of them around... dunno. While similar in progress to the Archers, the Catapults would then offer a different set of possibilities. First, they would get you within range of the Castle with just 3 icons, instead of 4 icons with the archers. Second, they provide a more powerful bonus (+2), which makes them a better long-game set of icons to hold. Kabanellas wrote: ...again, the same reasons apply here. Catapults are few and hard to get. So giving him a more operational feature could apart from compensating the less-bonus characteristic, be inside the logic of what a Field Marshal should be. I like it. Certainly attacking only 'S' Archers would be a step in the right direction. If you got rid of the Trebuchets, limited the assaults to only 'S' Archers, and then increased the number of catapult icons... that might make him 'worthy', while reducing the number of instructions on the icon. Kabanellas wrote: ...in the Lord Chamberlain case, I felt the need to add the extra layer bonus, to make them compatible with the other in terms of gains. In 5,6,7,8 players games adding family members will be quite difficult, while the Duke and the Bishop have a better capability of enlarging their owner bonus. well, the Chamberlain is overpowered now (or considered to be at 5 neutral), so surely one of the two layered bonuses can go. How about, for now, keeping the +1 autodeploy and getting rid of the 1 bonus for having the King (since that one is the weaker of the two)? Or, if you really want to keep the King bonus, make it bigger... say +2, and get rid of the autodeploy. No problem, this map deserves it. Outstanding posts, MarshalNey. Quite outstanding. I will post when I have something worthy of responding with. I'm posting from a gameplayer's point of view as I don't want to make a map I don't want to play. Totally agreed. I would not like to start with 4v1. This limits the decisions on the first turn, whereas more dice rolls means more options for strategy. I also agree that the nobles is not a great fix. More thought into this for me suggests more neutrals on the Court. This would both prevent quick kills and delay use of the Court until players were strong enough - this gives the game 2 stages which I like. You could opt for a direct strike or go through the Court... at roughly the same time. This would be awesome for fog games. I very much like (3), it seems to be in thematic step with the other Councilors. I think Kab and I discussed this and agree with removing the autodeploy. I think keeping the theme of Councillor + Collection is less complicated, I am ok with this also. I don't like the Catapult-Trebuchet mechanic as it stands. in fog games also. I think we can add more catapults for the Field Marshall, that would do it. This is looking good Marshal, thanks! adding more catapults on map while making them fit within the same logic of Archers seems good for game-play and conceptually solid. ....We don't have that much space to add a a continuous path of catapults, though... and on the other hand ,we wouldn't want to make them clone that much the archer mechanics. What if we substitute the trebuchets by catapults and let the castle catapults 1-way assault the nearest 'T' catapult ONLY. I do like the dynamic of the current trebuchets placement. Each spot covers 3 castles which is interesting. And coming to think of it I rather keep this layout then just planting catapults all over the map. We would be scraping the trebuchets (and its 'teleport' mechanics) substituting them by catapults. What do you think? Based on MarshalNey concerns and some of our own, chip and I made this last version. -King should be a neutral killer with 10 neutral troops in them – chip raised an important issue there, this 'bottle neck' problem is something that was bothering him - the capability of a player or a team (especially in quads) being able to control it and decide the game by doing it. I think that the odds are very low. A player that goes for a 10 or 14% chance would be rendering himself completely open for the targeted player's reaction. I wouldn't take the chance of losing an entire game in the first round for a 14% chance. I love this map concept. Just have a math nitpick and an idea for limiting attacks on counselors for you to consider. Please humor me as I indulge my passion. In an 8 player game, all things being equal you have a 12.5% chance to win. So increasing it to 14% is a good idea (unless you think your relative skills can give you more of an edge than 14%). Your chances of ultimately winning are 14% (first turn attack succeeded) + 86% (first turn attack failed) * probability you can still win after initial failure. Even if the chance you can still win after initial failure is just 10%, you have 14% + 86% * 10% = 22.6% chance to ultimately win. I'd definitely go for a 22.6% shot given 6-8 players. Players do not have unlimited options to attack any counselor from a single castle with a large stack. This gives players an incentive to control more than one castle rather than just pile on one castle. It also adds the interesting concept of political favoritism / cronyism between various counselors and family members. Reduces options (though not that much if instead of being able to hit all 4 counselors it shrinks to just 3). Thanks for working on this map - looks really cool and I can't wait to play it. As an afterthought - can you incorporate an Executioner? Like a neutral that the king can attack to then bombard any counselor/family member or restricted to anybody except the Bishop (unless we are talking about King Henry VIII who can do whatever he wants). ....as for the Executioner, I'm not seeing any real benefits on that, being the King a neutral killer that people will objectively grab to reach any castle on map. The Court Is working on a very direct movement from bottom to top (Nobles-Counsellors-King) that I'd like to maintain. Thanks very much for posting here, delighted you've come! As Kab has said his post preceding yours does fix the first turn kill problem. Take a look at that post and see what you think. chipv wrote: As Kab has said his post preceding yours does fix the first turn kill problem. Out of curiosity, what are the odds of a first-turn kill under the current version? I can't imagine that the odds are high; as long as they hover under 5% I'm happy. Very good point about the odds needing to factor in subsequent turns. Fortunately, with the killer neutrals on both conceivable paths to a first-turn kill at the Castle- the Trebuchet and the King- subsequent turns shouldn't add a significant chance. FarangDemon wrote: I firmly believe in KISS. Along these lines, as I've hinted in a previous post and some PMs, I think that this map could still use a reduction in the number of instructions in the legend. Maybe simplifying some of the bonuses. The thing that strikes me the most when reading this legend is the organization when reading it. I begin at the upper left, and I start reading about "terrain" bonuses, the Castle first, and then... a combo bonus with an icon I haven't read about yet (the Knight) that has two different instructions. Then, I read about the Villages. Still in the same area, the legend begins describing "unit" bonuses as well as their limitations and abilities. But, then it separates to the lower-left corner, and then continues detailing the Archer, Cataplut and Trebuchet. Then my eyes go to the upper right, and the Council is described, all nice and neat together. And finally the notes in the lower right. I think the left side of the legend could use some work. I noticed the "No bonus per region number" instruction is now absent on this version. Is there now a bonus per region number? If so, then the Combo bonus might not be really necessary to provide players with the troops to fuel initiiatives. The Castle and the Knights are both important in their own right, for both troops and for movement across the map (Castles give access to the King's Court, Knights allow rapid and open movement). Also, I noticed that there is an instruction under the Archers that says that they are not affected by impassibles, but that this instruction is not present under the Catapult. I think they should be the same, and in the interests of KISS, perhaps it is OK if Archer bombardment is affected by impassibles. Would this cause problems? This is a well laid out suggestion... and interesting. I'm not sure if it's feasible without complicating the Court too much, but there might be a good graphical way of implementing it. In gameplay terms, I especially like your point about creating incentive to own more than 1 Castle. MarshalNey wrote: Out of curiosity, what are the odds of a first-turn kill under the current version? All others options will just go below these numbers. -Should we ditch the Castle+Knight bonus? -Should we place it under the Knight legend? I noticed the "No bonus per region number" instruction is now absent on this version. Is there now a bonus per region number? If so, then the Combo bonus might not be really necessary to provide players with the troops to fuel initiatives. The Castle and the Knights are both important in their own right, for both troops and for movement across the map (Castles give access to the King's Court, Knights allow rapid and open movement). To be perfectly coherent that 'impassable' entry should appear in the Catapults area as well. I'll take care of it.